Necklaces come in an amazing variety of lengths. The chart to the right shows the most common necklace lengths as described below. Collar – encircles the middle of the neck – 12 to 13 inches long. Choker – lies just above the collarbone – 14 – 16 inches long. Princess – the most common length, hangs just over the collarbone - 17 to 19 inches long. Matinee – falls to the top of the bust – 20 to 24 inches long. Opera –sits at the breastbone – 28 – 34 inches long. Rope – any necklace longer than an opera necklace. Lariat – a very, very long version of the rope necklace, usually without a clasp, which can be wrapped multiple times around the neck, or the ends can be crossed over, looped or knotted in various ways. Niobium is a nickel-free inert metal. It is very resistant to corrosion and other reactions, and is used in medical implants. Niobium is not plated or painted, so it will not flake or chip. It is anodized, meaning it is colored by dipping it into an electrically charged bath. Most people who are sensitive to metal can comfortably wear niobium. 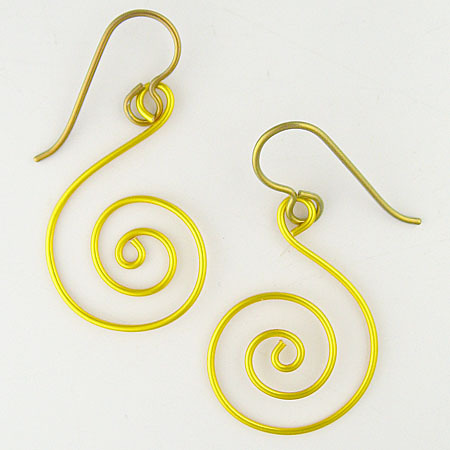 For this reason, I use niobium ear wires for earrings with copper components.